The Giraffes with the Arabs who brought them over to this Country. George Scharf, the Elder, Artist, Engraver and Plate Maker. c. 1835. Most of the printed pottery pieces show the three male giraffes in the center of the scene. They were named L to R: Mabrouk, Selim, and Guib. An example of the pattern printed in teal on a dinner plate. 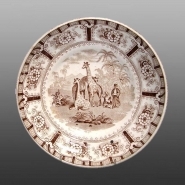 An earthenware saucer printed in brown from a tea service in the same pattern as found on the platter. A different border as used. It was not unusual for a factory to use different borders with the same center pattern, one on dinner and the other on tea services. An earthenware platter printed in blue with the Giraffe pattern. 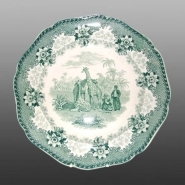 Ridgway produced this pattern with considerable success on both tea and dinner service items and it is still a favorite among collectors today. It was made in pink, purple, light blue and sepia. The border used on this platter is the one commonly found on dinner service pieces.